If you love to have music around, but have limited space in your room, here’s the perfect solution. In a simple slim body that can be placed on a shelf or wall-mounted, the X-SMC02 lets you listen to songs via Audio in/USB/Bluetooth connection, play CDs, or enjoy FM radio programms. The Auto Wakeup function activated by Audio in connection provides hassle-free instant playback from smartphones or digital audio players. 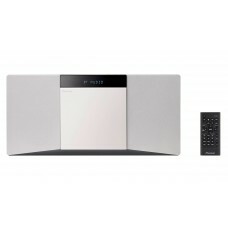 Enjoy the widespreading stereo sound across your room, delivered from the outward-facing speaker units.